Prove It: Do OPMs really boost enrollment? Companies like 2U, Pearson, and Wiley, online program management (OPM) firms that partner with schools to launch degree programs, ultimately stake their claim on one thing: hire us and we will deliver more online students than you could enroll on your own. But does this claim stand up? A number of these firms have been in business for well over a decade, but we are not aware of a study that compares enrollment performance at schools working with an OPM to those without such a partnership. Until now. Eduventures has crunched the numbers. We’ve been publishing reports on OPMs for five years, including our most recent report, Expanding the OPM Definition, and we have a solid dataset on which schools have worked with which OPMs. Today’s online market is increasingly crowded and competitive, one reason why schools look to OPMs for an edge. So how do OPMs do? Based on our analysis so far, the good news for OPM firms is that, on average, partner schools do outperform peers. 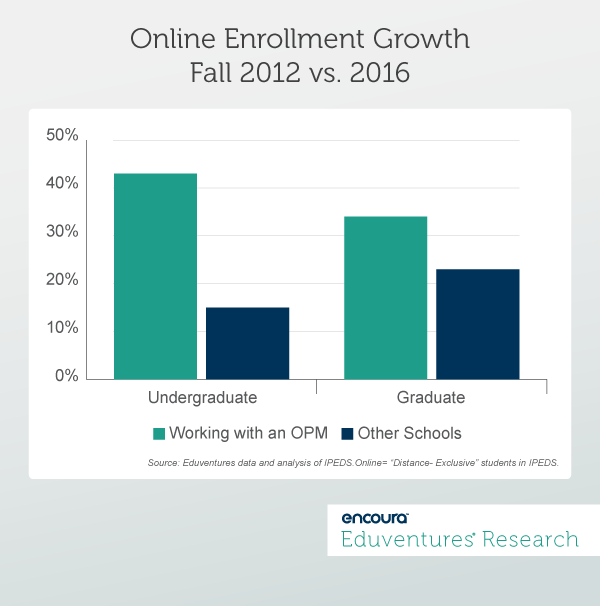 Figure 1 compares growth of fully online undergraduate and graduate enrollment in fall 2012 and 2016 between OPM and non-OPM schools. Fall 2012 is the first year with federal data for online student enrollment, and fall 2016 is the most recent year for which we have this data. Let’s start with the headline numbers. At the undergraduate level, schools working with an OPM together experienced a 43% bump in fully online enrollment between 2012 and 2016, almost three times the 15% growth seen by non-OPM schools. The gap is smaller for graduate students, but OPMs still helped drive about 50% superior performance compared to non-OPM schools. Faster undergraduate growth makes sense. The undergraduate online market is larger than the graduate one (about 2.2 million undergraduate students compared to about 820,000 at the graduate level), but when it comes to market share, graduate wins hands down. In fall 2016, about 28% of all graduate students were studying fully online, compared to only 13% of undergraduates. The total undergraduate market is a massive 17 million students strong (versus only three million graduate students), meaning much more room for online to grow at the undergraduate level. Also, fewer schools are wholeheartedly promoting fully online undergraduate degrees, leaving more space for OPMs to out-perform. At the graduate level it is “easier” for schools to do online well on their own. There is a natural affinity for online learning at graduate level, serving busy but sufficiently academically accomplished adults to thrive with an unfamiliar delivery mode. The short length of the master’s degree—the most popular online program at the graduate level—compared to the bachelor’s also helps. With or without an OPM, online graduate programs often do well. The OPM/non-OPM contrast is more striking if the handful of online giants are removed—schools like University of Maryland University College (UMUC) and Southern New Hampshire University (SNHU). For these schools, online is the core business and they do not work with OPMs. If those schools are excluded, non-OPM schools grew online undergraduate enrollment only 8% over the period. At the graduate level, minus giants, non-OPM growth slipped to 18%. Which schools are in the dataset? Active OPM relationship: signed in early 2015 or prior (to ensure the alliance has had time to show an impact). Not too small: reported more than 300 fully online undergraduates and/or graduate students in fall 2012 (to avoid large percentage growth from a small base skewing the average). OPM partnerships only: excluding other kinds of marketing, product, or service relationships. Our OPM partner list includes two- and four-year schools, but few two-year institutions work with an OPM. Some schools work with multiple OPMs. As our latest OPM report points out, the lines between OPM and non-OPM firms are increasingly blurred, and it is easy to get confused about which companies to focus on. There is also no comprehensive database of which schools work with an OPM. Not all OPM partnerships are widely publicized, and start and end dates are often less than transparent. We have checked our list, developed over a number of years, against other published reports and found very few alliances we were not aware of, giving us additional confidence in our data. So, on the evidence examined to date, the OPM pitch looks compelling. But, of course, just because schools with an OPM partnership have out-performed the market as a group does not mean that every partnership pays off. Some OPM schools have super-charged online enrollment—well over 200%—while others are flat or declining. Numerous factors, such as institutional commitment, market maturity, and program quality, affect enrollment, not just the presence or absence of an OPM. The online higher education market does not stand still, and as the small print warns, past performance is not a guarantee of future performance. Moreover, as online learning continues to mainstream, more schools may decide the modality is a core business and worry that an OPM might limit institutional capabilities long-term. When judging an OPM, it should also be noted that enrollment is not the only metric that matters. Student engagement and outcomes are just as important. This Wake-Up Call is an initial overview of our current OPM enrollment research and as part of Eduventures’ ongoing body of OPM research, we will be exploring this topic in greater detail. As we continue to evolve our OPM coverage—and advise schools and companies in this area—we welcome ideas and feedback. Online learning has been part of higher education for almost 30 years. Students studying either fully or partially online make up 31% of U.S. undergraduate enrollment (as of fall 2016), and 37% of graduate enrollment. Join us to learn the revelations of CHLOE 2: A Deeper Dive, an annual survey of online learning leaders. Produced by Eduventures and Quality Matters, with support from iDesign and Extension Engine, CHLOE 2 covers a wide range of topics from enrollment and competition, to organization and leadership, to tuition and outcomes and seeks to understand online learning policies, practices, and plans and ultimately, institutional impact.